Sigh, as has been the case time after time I am back to Zero with Kyudo. ok, so maybe not “zero” but it feels like it. I thought I was making some improvement, in the big picture I am. It is said something like one can not cure and illness until the cause is known. I may have at least a clue what my current issues are. So I had thought part of my problem, a big part was that I was not understanding everything. Which may still be, some of the case . However I am now leaning toward it is a physical issue. My shoulders are not loose enough. I keep getting told to drop my shoulders. In Daisan do not raise my shoulders, when in ready position move my elbow forward but not my shoulder. Try as I may I can not comply enough. I am trying but not succeeding. ( There is not try , do or do not. I am doing not!!) I watch the Sensei and his shoulders are much looser he has a greater range of motion. I do not know if I need more stretching or it is just a physical body structure issue. I recall when I was young my mother use to tell me a lot, pull your shoulders back! Maybe I was physically unable to do any more than it was. Not deformed, just different. Perhaps if I had worked at it then it would be better now. I am I believe now too old to reshape my bone structure. Pretty certain. I will continue to attempt to succeed but I may have to make compensation somewhere else. Yesterday The Kaicho came over to me whilst I was shooting and I told him my ya always go just to the right of the target. Sometime they go correct, but when it happens it because I am doing something with my right arm they tell me not to do. Which is to pull my elbow back to far. As in to my rear, not to my side out away fm me opposite the target. Kaicho watched me shoot and said my left shoulder is to far forward when in Kai. He had me shoot again and corrected me as I held position and released. It went straight. However I did aim more to the left than I had been. What I am saying is I read about the aiming point, half-moon , whole moon thing. I pretty much line my ya tip up with the target, not the whole or half-moon thing. When I asked m from the tip, my hit count goes up. However sometimes the ya goes too far to the left of the Target. Maybe I should stick with the way that gets the most hits and not listen to when the tell me to do something different, however I feel if I do that I am just being a “target who’re” is the term used. I head reports from the recent big Shinsa in Tokyo. 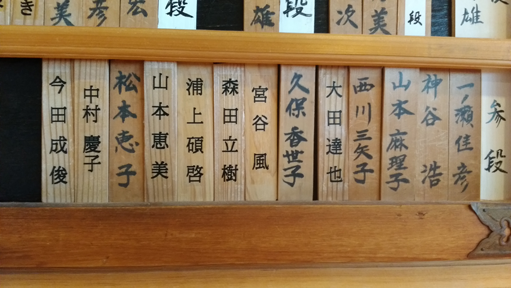 There are people who shot for Yondan and only hit one, but still passed! Crap! That throws off the theory about testing in Japan is harder. Someone speculated that it was because there was a seminar just before the Shinsa and the judges got to see how the person shot regularly.